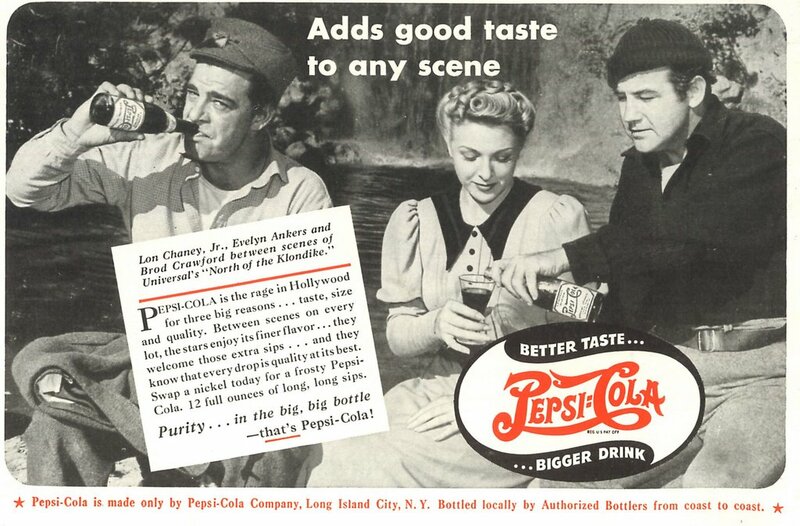 It’s Pepsi time on location for Universal’s big bruisers in residence, Lon Chaney Jr, and Brod Crawford, as they take an unexpected soft drink break from the rigors of yet another interchangeable "B" actioner in which they’re starred. You can’t tell us these boys didn’t have another bottle stowed away in the hollow of one of those trees North Of The Klondike. The very idea of marooning Chaney and Crawford in the wilderness without stronger libation would just be unthinkable. Evie seems content enough with her soda pop, but Lon looks downright threatening. Unless that bottle’s spiked, we fear the big guy’s gonna be making some trouble in the next few minutes. Brod seems a little more composed. Has he told Lon about that thermos he smuggled onto the set? If not, these two are liable to come to blows --- and it won’t be the first time either! Dear Sir: My late father, Stuart wrote the pilot --as well as many subsequent episodes of "Highway Patrol"(10-4!) Brod was often at the house when I was a kid -- trust me on this -- he had another bottle handy when the shoot was done (and judging from the expression on Lon Jr.'s celebrated kisser, it can't be soon enough!P.S. :Really enjoy your postings! Whoa! What a great anecdote of your encounter with Brod! Wish I'd been there! Thanks for sharing.